Martin Kelleher, managing director of SuperValu, Caroline Cashen and Eoin Kennedy from Buckley’s SuperValu, Moate and Irene Collins, managing director of EIQA pictured at the SuperValu Quality Awards. 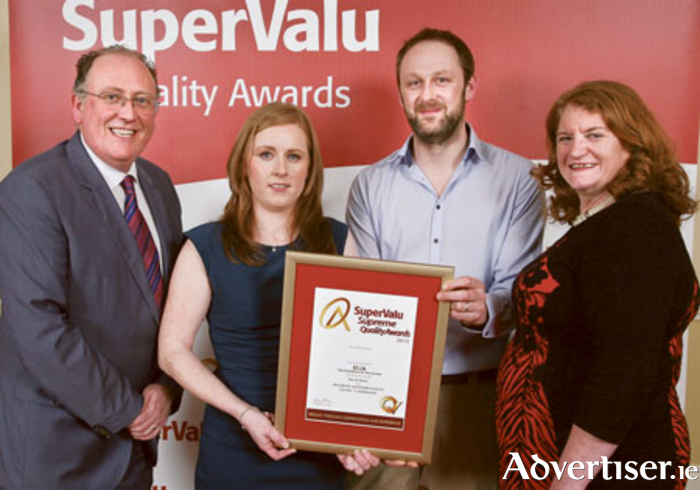 Four SuperValu stores in Westmeath were awarded the highest accolade of food quality, The Supreme National Hygiene and Food Safety Award, at the recent 2015 SuperValu Quality Awards in Killarney. The awards are accredited by the Excellence Ireland Quality Association (EIQA ) and identify retailers throughout the country who have gone above and beyond in maintaining the highest quality standards for more than a three year period. The successful stores were Buckley’s SuperValu Moate, SuperValu Kinnegad, Buckley’s SuperValu Mullingar, and Smith’s SuperValu Athlone. These awards are a huge testament to the rigorous standards these stores in West Meath place on hygiene. The awards, which were presented by Martin Kelleher, managing director of SuperValu and Irene Collins, managing director of EIQA, were independently audited by Excellence Ireland Quality Association (EIQA ). Commenting at the awards, Martin Kelleher said; “I would like to sincerely congratulate SuperValu stores in Westmeath for showing such huge commitment to our food safety and hygiene programme over the past three years or more, and for achieving this much coveted award. It is a huge honour to receive a Quality Award from the EIQA, as it is an independent certification of the highest standards of operational hygiene and food safety in the food sector business. SuperValu stores throughout the country are committed to continuing to push out the boundaries of food excellence from food production to the supermarket shelf, never losing focus on consistently delivering exceptional quality.